This year’s Bike to Work Week (BTWW for those of you into the whole brevity thing) is nearly upon us. 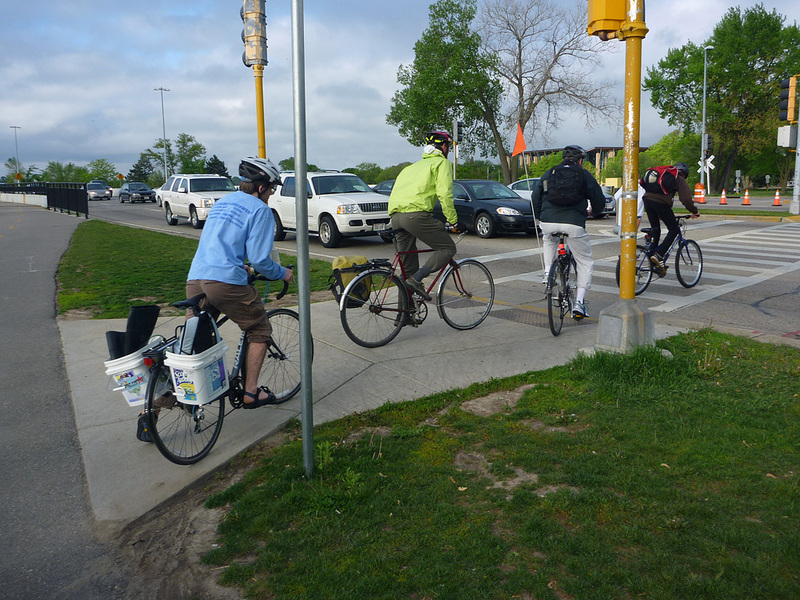 Free coffee, pastries, bike-tuning, and other goodies on the bike paths every day. But what BTWW brings us more than anything else? A huge spike in bike commuter traffic, especially downtown and on the bike paths. Bitter, grouchy curmudgeons like me are likely to see this as a mere annoyance. And it is an annoyance, to some degree, largely because many of the riders that make up the increased traffic are unskilled, mildly confused, and riding bicycles of questionable maintenance history. And most of them will evaporate like fog on a summer morning once the week is over. But a few of them won’t — and that’s a fine thing. So I’ll try to be a little more patient with the feckless morons clogging up my normal commuting route (and perhaps I’ll get out of my normal, deeply rutted route a bit too). And let’s face it, given my recent bout of achilles-related pain and suffering, I’ll be happy to be riding at all.